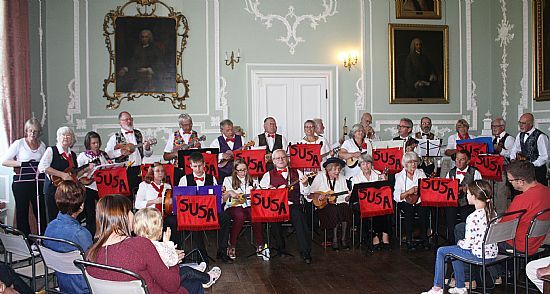 The official club name is Severnside Ukulele Strummers Association or SUSA. The club is one of the longest running in the U.K. and our songbook includes over 500 songs. However, the club is open to ukulele players of all abilities and if you fancy a strum and a singalong you're very welcome to pop along for an evening. We meet every Thursday in Kidderminster at St George's Social Club which is behind St. George's Church. From A456 turn into Radford Avenue and then right into Gilbert Scott Way and the Social Club is on the right. The Post Code, DY10 2EZ. The beginners' session, where we go through chords and tips, is from 6.45 until 7.30pm and the general club starts at 7.30 until 9.30pm. Beginners are encouraged to stay for the whole evening. Regular attendees need to be members of St. George's Social Club (annual membership currently £12). The evening fee is £1.50. You are welcome to come along and try us before deciding to become a member. The Chairman is John Browning, the Secretary is Gaynor Butler, the Treasurer is Val Bradley, the Membership Secretary is Mick Danks and the Computer contact is Don Wasdell. Other members of the Committee are Mark Pickering and Martin Allen.